We had sandwiches for dinner. Funny how a sandwich for lunch seems awesome, but having a sandwich for dinner sounds like we’re not trying. What did the poor sandwich do to deserve this double standard? If I called it a crostini, then we would be impressed. 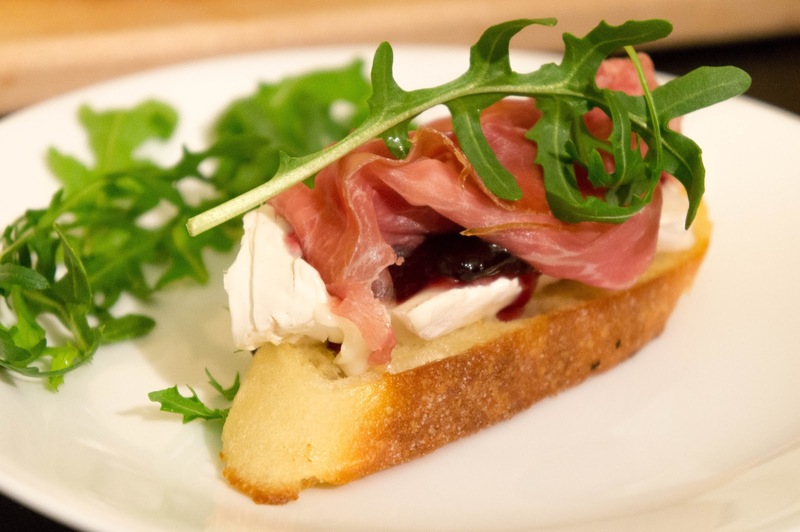 But really, what is a crostini but an open-faced sandwich with nice crispy bread? Sometimes I am a food philosopher. Seriously though, sandwiches are simple and fast; great for a weeknight dinner. And by choosing delicious components there’s no need for them to feel lazy at all! Win win. Let’s combine triple crème (yes triple!) goat’s milk brie, 24-month aged prosciutto, and cherry vanilla jam. Let’s put it all on some pan fried baguette slices and let the brie melt a little. If you’ve never tried goat’s milk brie, it’s got the texture of regular brie with a more subtle taste. I loved it the whole one time I’ve had it. The arugula is just for show; a little green peppery bite. Speaking of which, now I have most of a box of arugula in the fridge that I don’t know what to do with. Suggestions? The sweet tartness (is that an oxymoron?) 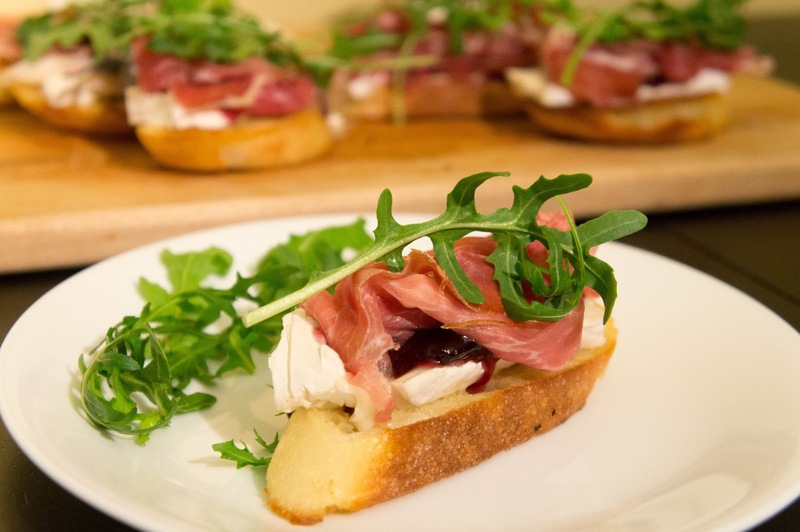 of the cherries meets the saltiness of the prosciutto and the creaminess of the brie in perfect harmony. How’s that for a sandwich? Slice your bread into nice thick slices. Slice the cheese and get it ready. In a frying pan over medium heat, melt butter and oil (the oil helps the butter not burn). 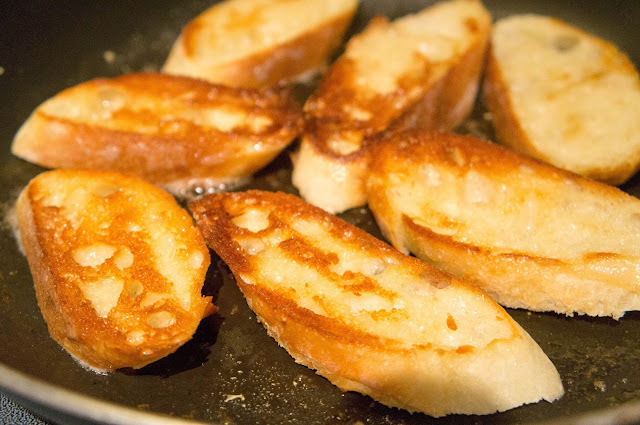 Place bread slices in hot, melted butter/oil and fry for a few minutes or until nice and golden. Flip the bread slices over and top with brie while the other side is browning. This lets the brie warm and melt a little. Remove from heat and place on a serving platter. 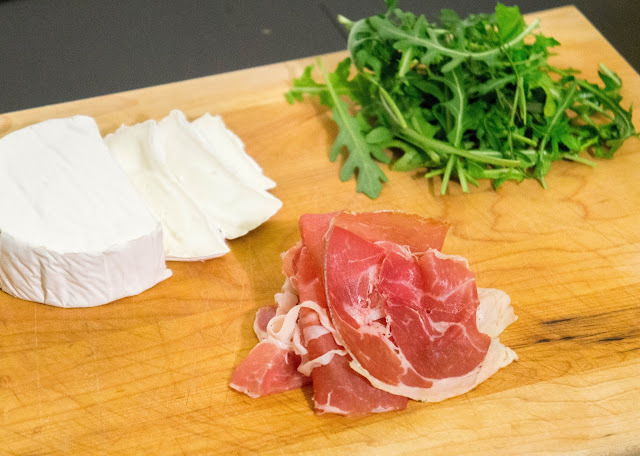 Top each slice with a tsp of jam/preserves, some prosciutto, and a couple sprigs of arugula. So simple but so delicious. I totally love the combination of jam and cheese. Never tried it with prosciutto on top! Thanks for sharing.